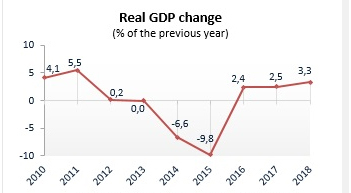 Ukraine’s GDP rose 3.3% yoy in 2018, accelerating from 2.5% yoy in 2017, according to the State Statistics Service of Ukraine’s report published on March 21, 2019. In details: the nominal GDP amounted to UAH 3,559 bln ($130.8 bln), increasing from UAH 2,984 bln ($112.2 bln) in 2017. Real GDP rose 3.3% yoy in 1Q18, 3.8% yoy in 2Q18, 2.8% yoy in 3Q18 and 3.5% yoy in 4Q18. Private consumption, which grew 8.9% yoy was the major driver of economic growth in 2018. Investment in 2018 rises 14.3% yoy. The contribution of net exports in 2018 remained negative with a real export decline of 1.6% yoy and a real import increase of 3.2% yoy. On the production side, growth in 2018 was driven by agriculture - 7.8% yoy, trade - 3.7% yoy, and construction - 7.2% yoy. The GDP deflator amounted to 15.4% (vs. 22.1% in 2017). Summary: Ukraine’s economy might slow to 2.9% yoy growth in 2019 due to less impressive agricultural performance.